Share our Zero Peroxide Review review. With the recent change to EU regulations regarding peroxide based teeth whitening products, there have been many new alternatives launched. The latest home teeth whitening kit is Zero Peroxide, which as the name suggest is peroxide free. So what makes this non-peroxide kit different from the others and can it really whiten teeth without peroxide? Like most non-peroxide teeth whitening kits, Zero Peroxide uses a sodium bicarbonate based gel which needs to be applied directly to teeth. Used for many years as a cleaning agent, Sodium Bicarbonate is a popular ingredient for teeth whitening products and even toothpaste. Its ability to whiten teeth is well documented and proven plus is completely safe to use with no risk of irritation that can be associated with peroxide. The Zero Peroxide gel is enhanced with other natural ingredients such as pomegranate and chamomile to provide all-round oral health. There is little evidence to suggest that any of these additional ingredients enhance whitening, but they do have antibacterial properties and fight against dental plaque. Pomegranete for example has been shown to reduce plaque and prevent it from reforming. This means that the Sodium Bicarbonate can get to work on your teeth and not a layer of plaque. The gel also contains sodium fluoride to help strengthen teeth against decay. This won’t make your teeth whiter and you may already be applying sodium fluoride whithout realising since it’s commonly used in toothpaste and mouthwash. What’s in the Zero Peroxide Teeth Whitening Kit? Before starting to use any teeth whitening home kit we would always reccommend cleaning your teeth with your usual toothpaste to ensure that the gel has a clean surface to work with. Apply a thin layer of Zero Peroxide Gel to the mouth tray and place in to the mouth to cover the teeth. Unlike many teeth whitening mouth trays, the ones includes with this kit are made from clear super-soft silicone. This means that they should flex and fit neatly in to place without the need to prepare them in advance by heating and shaping. You should keep the mouth tray in place for at least 30 minutes for the gel to get to work but you caa see results in as little as 20 minutes. The Zero Peroxide kit also contains a LED blue light accelerator to help speed up the oxidising process that contributes to the whitening effect of the gel. Its easy to use while the mouth tray is in place and the clear silicone is an advantage over other trays which are often only semi-transparent. To track your progress, use the teeth colour chart included in the pack. Keep everything fresh for your next treatment with the handy travel bag and mouth tray case. What makes Zero Peroxide different? With so many similar teeth whitening kits available we thought that it was important to highlight the things that set Zero Peroxide out from the rest. The mouth trays included with this kit are much better quality than the usual ones provided and they have actually been designed to work with the blue light accelerator. In addition the full kit comes with some great extras like the travel bag and mouth tray case to keep everything fresh every use. Most non-peroxide whitening gels come with a few extra ingredients packed in for good measure and Zero Peroxide is no different with Aloe, Pomegranete, Chamomile and Vitamin D added for healthy, strong teeth and gums. 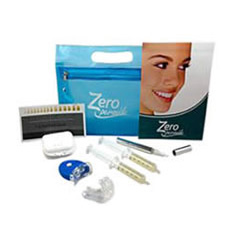 During our research for this Zero Peroxide review we have found it to be a high quality home teeth whitening kit with great attention to detail when it comes to customer satisfaction. The Sodium Bicarbonate whitening gel might be very similar to other whitening kits but extras like the mouth tray holder, touch-up pen and travel bag the full kit has everything you need. This does however come at a price with the full kit retailing for $99.99. With none of the painful irritation that can be caused by peroxide teeth whitening, the Botanical White Kit is based on a natural formulation of ingredients including Sodium Bicarbonate, Pomegranate Seed Extract and Aloe Vera, making it one of the best selling teeth whitening kits for home use. With prices starting from £34.99, it's our best non-peroxide kit. This peroxide based kit is probably the most effective way to whiten teeth which is why Dental White is our top rated way to whiten teeth at home. Botanical White is a teeth whitening kit which is peroxide free and made from 100% natural ingredients. It completely safe to use at home. The latest home teeth whitening kit is Zero Peroxide, which as the name suggest is peroxide free. Mint Cosmetics offers a great value complete non-peroxide whitening kit with everything that you need for teeth witening at home. Teeth whitening at home has become extremely popular in the UK. Our reviews bring you the facts about the best teeth whitening kits for sale online today, helping you make the right choice.